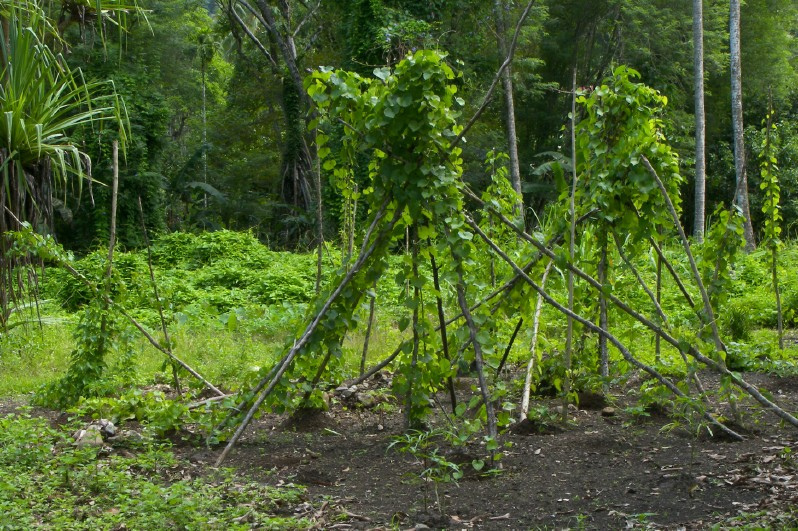 A yam garden in PNG. Public Domain image. Currently, the case of the Yam Hole (Ambisi) is an ongoing dispute amongst our people in Wagang Village, Lae, Papua New Guinea. The national government is negotiating with the villagers to build a large fisheries wharf on my village. Wagang is a small coastal village less than 20 minutes drive to the heart of Lae City. This is the story about the site of the proposed development which is referred to as Ambisi, or the Yam Hole. The Yam Hole is my family’s inheritance, but due to foul play, the authorities have been negotiating with other people who have claimed to own the land referred to as the Yam Hole. With the permission of my Uncle Ahe Max Mambu, I am proud to tell you this oral history and a story about the Yam Hole as told by my late grandmother Geyam Baim to me. This story was told to my grandmother by her mother Geyamtausu Baim and her aunt Awelu Hampom. In one of the flash fiction stories I wrote in Monday’s Finish the Story, I made a reference to this story in Scatterings of the Blood River (Budac) and how a child was discovered. My grandmother told this story almost every evening and in between other stories after our dinner. When I was 15, I presented the story of the Yam Hole to a large crowd of Lae City residents in the Lions Club Youth of the Year awards. It was in 1980. I represented Busu Provincial High School in the Lions Youth of the Year challenge. In the competition, an outstanding student was picked from all high schools and tertiary schools to give a five-minute original speech of cultural significance. After a gruelling week of interviews in an elimination process, the final test was to give a five-minute speech in front of business houses, leaders, and distinguished guests of the Lions Club (a large charity organisation) in a 3-course dinner event. That evening, I borrowed a batik skirt, a white cotton blouse and a pair of sandals from my high school principles’s wife. I did not have anything of such quality and was specifically instructed that it was a high society gathering and I must not even wear slippers. Most children owned a pair of slippers or jandals, which we wore to school. None of my family members had any fancy clothes, let alone shoes of any kind. Despite not having anything smart to wear, my family was excited because I would make this speech about our ancestry. I tried to practice my speech in English because in Bukawac, I knew it by heart. It was after all, out family history. My speech, although based on the Yam Hole and our family’s oral history; featured my great-grandmother and her sister and how they fought the white men/Australian administration and German missionaries to settle and remain in our village. The two sisters were not prepared to give this land away because it was fertile, had clean drinking spring water and completed with two large rivers circling the entire village portion of the land. Part of this land is where Lae city sits on and part is where our village is. The Lions Club evening was also the evening I learnt to use knife and fork at a table for the first time. Each finalist Lions youth was sat at a table consisting of dignitaries and business people. Our conversations were also marked. I sat in my ‘borrowed’ clothes, the wrap skirt feeling too tight. I struggled to keep the slightly larger sandals on my feet with my napkin still on my lap while I carried on what seemed to be a normal polite conversation with very important strangers at my table. In front of me, on the huge white dinner plate, I tried to elegantly spear my dead cooked half-chicken while it gracefully danced on this huge white plate. I remembered, how crowded the table was with no room to move. It had too many flowers, candles, cutlery, glasses and people, while the food on the huge plates were in very small neat quantities. I could not really tell you which was scarier; the conversation, avoiding the glasses on the table, using the wrong cutlery, losing my borrowed skirt or shoe or catching and eating the dead chicken on the big white plate without getting any of the sauce on my white cotton borrowed blouse from the principle’s wife. I was very hungry, but I had to keep calm and keep it all together until I told the audience my oral history about the Yam Hole. More on the Yam Hole later on this blog. Enjoy a visit to Joycelin’s blog where she is sharing some special stories about oral history. Thank you very much sis. Enjoy your day. What an adorable memory. Thanks for sharing. I really enjoyed it, Joycelin. Hi Kevin – how are you? Did you have a good Thanksgiving? Have you lost my email address? Good to hear from you.